A copy of Debora alias Dolly Kanner's memoires entitled "Fragments - The Story of Debora", an interview with Betty Jakobovits or Jakubowicz and a Schnitzer family tree are available at the Kazerne Dossin reading room. The included photos of Marcus Schnitzer, Izak Schnitzer, Anna Schnitzer and Judith Schnitzer were used to complete the "Give them a Face" portrait collection (KD_00017) and the commemoration wall at the Kazerne Dossin museum. The Wolf-Schnitzer collection (KD_00539) contains photos of Ella Schnitzer and her husband Sender Wolf. Tauba (called Toni) Schnitzer, was born in Dembitze, Poland, on 17 August 1904, as the daughter of Moshe Eliezer Schnitzer (born on 4 September 1880 in Oswiecim, Poland) and Genendel Weindling (born on 4 November 1879 in Debica, Poland). Tauba was the oldest of 13 children. The Schnitzer family emigrated from Poland to Cologne, Germany, around 1910 and spent the First World War in Scheveningen, the Netherlands, before emigrating to Belgium in 1922. They settled in Antwerp where most family members earned a living as diamond polishers in the workshop on the first floor of the family home. On 26 May 1925 Tauba Schnitzer married Samuel (Sam) Kanner, a diamond merchant, born on 22 March 1897 in Sokolow, Poland. Tauba and Samuel would have three children: Wolf Leib alias Wolfy (born on 25 January 1927 in Antwerp), Deborah alias Dolly (born on 27 May 1929 in Antwerp) and Isidore alias Isi (born on 10 November 1932 in Antwerp). The Kanner-Schnitzer family was religious and well-to-do. After Samuel Kanner suffered a stroke in 1938, Tauba became the breadwinner of the family, working in the diamond business. Samuel Kanner passed away in Antwerp on 6 September 1939. Upon the German invasion of Belgium on 10 May 1940, Tauba Schnitzer tried to flee south with her children, but she decided to return to Antwerp after the Belgian capitulation. Tauba then joined the resistance together with her brother Salomon and the Sohet sisters, including Olivia and Mathilde, which Tauba had befriended. The group smuggled Jews from Belgium to southern France where one of the four sisters lived. In August 1942, Tauba also sent her oldest children Wolfy and Dolly to Olivia Sohet and her husband René Minet, who lived in Agimont, a small village in Wallonia. When Mathilde Sohet went to collect Tauba and Isi in Antwerp the following day, on 29 August 1942, mother and son had been arrested during the second large raid that was organized in Antwerp during the previous night. Although Mathilde was able to get Isi out of the school where they were being held, Tauba Schnitzer remained under arrest. She did not survive deportation from the Dossin barracks to Auschwitz-Birkenau via Transport VII on 1st September 1942. All Kanner children would survive the war. Isi remained hidden with the Minet family in Agimont, Dolly was hidden with her aunt Ella Schnitzer in Brussels and Wolfy was smuggled to Switzerland. 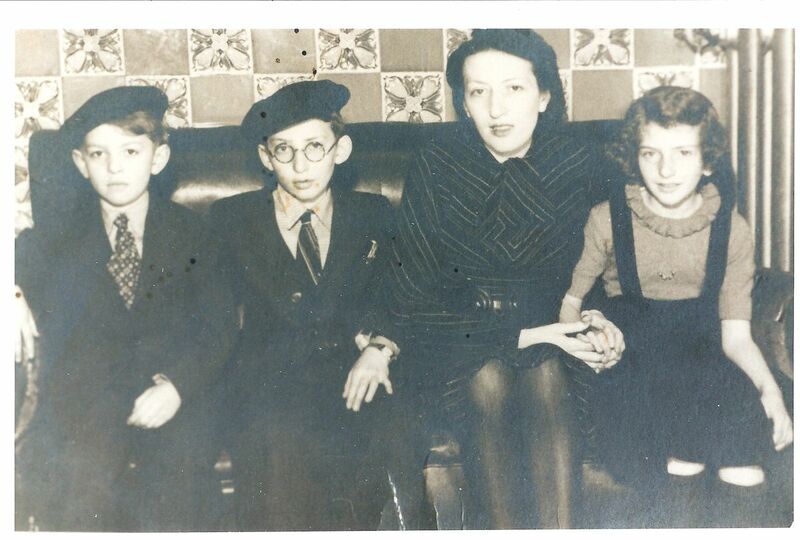 In 1945, after liberation, the Kanner children were taken in by their paternal uncle Avrum Kanner and his wife Esther Lederman. The Kanner siblings then emigrated to Israel, as did most of their remaining relatives. Wolfy kanner passed away in 1986, Isi Kanner in 1987. Dolly married Eliezer Abramovitch, a friend of her brother Wolfy whom he had met at a children’s home in Switzerland. Eliezer had been born in Kalisch, Poland, on 22 February 1929 but emigrated with his parents to Belgium in the 1930s. During the war, Eliezer was smuggled to Switzerland by the young Jewish girl Betty Jakobovits or Jakubowicz. Eliezer Abramovitch passed away in 1995, Dolly Kanner still lives in Israel. The Schnitzer family lost many relatives during the Holocaust. Parents Moshe Eliezer Schnitzer and Genendla Weindling moved in with their son Marcus Schnitzer and their daughter-in-law Fanny Spingarn in 1942, thinking Fanny’s Belgian nationality would protect them from deportation. However, Moshe and Genendla were arrested during the fourth and last big anti-Jewish raid in Antwerp and were deported from the Dossin barracks to Auschwitz-Birkenau via Transport XI on 26 September 1942. Both were murdered. Of their 13 children only four would survive the war. Apart from Tauba, oldest son Josef Schnitzer (born in 1906) was deported from the Dossin barracks to Auschwitz-Birkenau via Transport XVI on 31 October 1942. On the same train were his wife Fanny Biedermann and their children Anna and Judith Schnitzer. Marcus Schnitzer (born in 1908) who did not want to leave his parents when they were arrested during the raid was deported together with them via Transport XI. His wife Fanny Spingarn and their daughter Francine Antoinette Schnitzer survived the war, as did Fanny Schnitzer (born in 1909), her husband Samuel Koth and their son Zigmund. Rosalie Schnitzer (born in 1911) was also arrested during the fourth anti-Jewish raid in Antwerp and deported from the Dossin barracks via Transport XI, while her husband Israel Szapiro would be deported via Transport XVII on 31 October 1942. Their children Henri and André Szapiro survived the war. Izak Schnitzer (born in 1913) was deported from the Dossin barracks to Auschwitz Birkenau via Transport II on 11 August 1942, his wife Chaja alias Fanny Liebermann recta Bauman and their daughter Debora Schnitzer survived the war. Ella Schnitzer (born in 1914) and her daughter Betty Wolf survived the war. Ella’s husband Sender Wolf was deported from the Dossin barracks to Auschwitz-Birkenau via Transport VII on 1st September 1942. Salomon Ksil Schnitzer (born in 1916) and his wife Ruth Exman survived the war by fleeing to Switzerland. Samuel Schnitzer (born in 1918) was able to emigrate from Belgium to Palestine in 1939. Osias Schnitzer (born in 1920) and Pinhas named Paul Schnitzer (born in 1923) were deported via Transport XVII from the north of France via the Dossin barracks to Auschwitz-Birkenau on 31 October 1942, Berta Schnitzer (born in 1922) from the Dossin barracks to Auschwitz-Birkenau via Transport VI on 29 August 1942. Youngest brother Juul Schnitzer (born in 1925) was caught trying to cross the French-Suisse border and did not survive. Debora alias Dolly Kanner and her daughter Michal Gebert kindly donated digital copies of a selection of family photographs to Kazerne Dossin in 2018. The donation also included the testimony of Debora alias Dolly Kanner and an interview with Betty Jakobovits or Jakubowicz, which were added to the Kazerne Dossin library, and a family tree.